Indian philanthropist Rajashree Birla, chair of the Aditya Birla Centre for Community Initiatives and Rural Development named for her late husband, pledged another $1 million for Rotary’s efforts to eradicate polio. Birla has already contributed more than $10 million to the effort. Birla's company, Aditya Birla Group, has revenues greater than $40 billion. Fellowship is the biggest part of any Rotary Convention, and the week wouldn’t be complete without Host Organization Committee events welcoming attendees to Atlanta, showing off the city, and giving members a chance to get together and socialize. Check the committee's site for the latest information. “If there’s one thing I’ve learned this year, it’s that when two Rotarians get together, and start talking about service--there’s just no telling where that might lead,” said Germ. "One Small Act: A Virtual Reality Experience": Thousands will gather to watch Rotary’s new virtual reality film and participate in one of the largest ever simultaneous VR viewings. Rotarians will use Google’s virtual reality viewer, Cardboard, to join the extraordinary journey of a child whose world has been torn apart by conflict. The Rotary Foundation's 100th Birthday Party: What’s a party without cake and ice cream? Guests will enjoy both as they celebrate the Foundation’s 100th birthday. Convention attendees represent 175 countries and territories, and many are proud to wear their countries’ traditional attire, such as the Indian saris above. Rotary President-Elect Ian Riseley and his wife, Juliet, cheer on our speakers. Monday’s session includes remarks from the Georgia Governor Nathan Deal, Indian philanthropist Rajashree Birla, and RI President John Germ. Philanthropist Rajashree Birla shares memories of life in India before the country was declared polio-free in 2014. John Germ thanks Birla for her generous donation to End Polio Now. Birla, a Rotary member of 10 years, runs a nonprofit that promotes community development in India. The announcement of Rajashree Birla’s US $1 million donation to End Polio Now brings audience members to their feet. 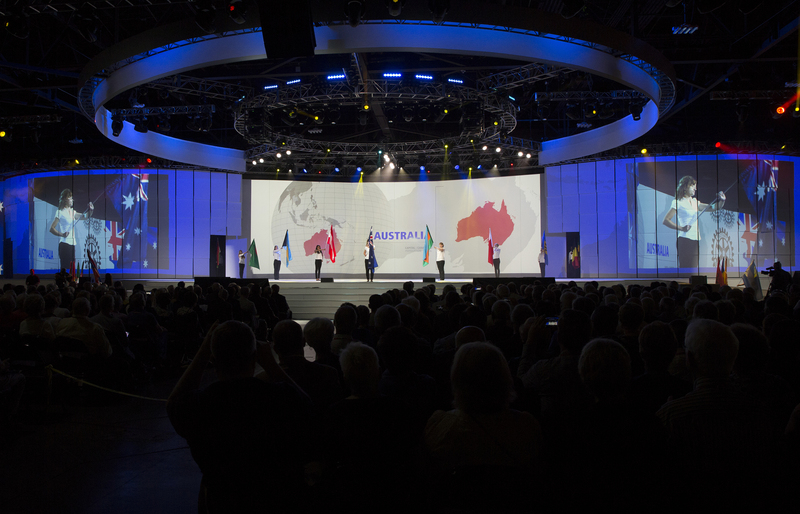 The last flag to cross the stage at the opening ceremony is the one that unites us all: the blue and gold flag of Rotary International.